A depraved killer butchering women at will. A traumatized city spinning out of control. Can Harry Hawkins end the pain? The worst serial killer in British history has started up again after a fifteen-year break. As he roams the streets of London slaughtering vulnerable young women, apparently at will, panic spreads across the city and the public screams for action. But as with the killer’s first spree, no cop can find a trace of him, no profiler can get inside his head, no camera can capture him. With the authorities at a loss Detective Inspector Amisha Bhanushali, heading up the hunt for the maniac, reaches out to her old boss Harry Hawkins – who was defeated and damaged by ‘The Crawler’ first time round – for help. Can he be coaxed out of retirement, deal with his own demons, and help her run the evil down before more innocents die? 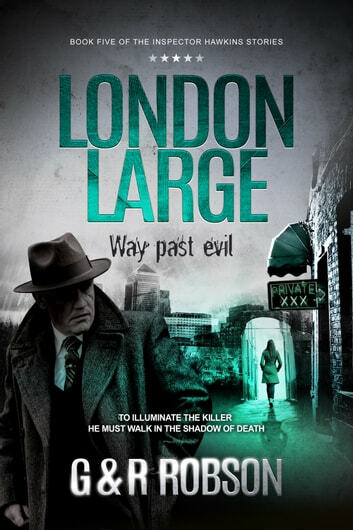 Way Past Evil is the latest in the sensational London Large series of hard-hitting thrillers. If you like gritty, non-stop action and suspense then you'll love this latest offering from the Robson brothers, a growing force in British crime fiction. The London Large books do not pull their punches. If you require a trigger warning of any kind they are NOT for you. 10 past midnight just finished the book and I’m in shock. You’ve outdone yourselves again, absolutely brilliant lads! Again just Wow! This is the first book in a long time I've HAD to put down and take a break from! Boys this is fantastic. Couldn't put it down finished in a day. Cant wait for the next one!! Great read. H is a Private Eye teamed up with his son Ronnie in the firm. 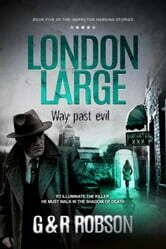 I really enjoy reading Garry&Rob's London Large series. Gripping action sequences, always looking into the "human element" of good& evil people, places and things. Highly recommended.